What Do You Mean My Book Is Out of Print? One of the most common concerns authors have about using a traditional publisher is the publisher’s demand that the “term” of a contract last for the life of the work’s copyright. When you consider that the average copyright is in force for the lifetime of the author plus seventy years, this certainly seems excessive! And as much as non-traditional publishers like to claim that they do not attempt to control as many rights in an author’s work as a traditional publisher does, I’ve noticed lately that they, too, often demand the same time period for their contracts. Whether you’re on the traditional or non-traditional path, when you’re offered a publishing contract, you should look at the contract for the following language: the term of the contract shall extend through the full term of the copyright in the work and all renewals. Assuming the publisher is demanding the usual overly long term, you need to look for a second provision which may be located in a “termination” section of the contract. You’re looking for language like this: the author may terminate the publishing contract if the publisher fails to keep the author’s work in print. If this clause is in your contract, good—now you need to know what it could mean to you. If this clause is not in your contract, then you will soon understand why you should request its inclusion. The expression “in print” has traditionally meant that a written work is being offered for sale by a publisher. “Out-of-print” is its opposite—the publisher no longer offers the written work for sale. A diligent author always wants his work to be available to potential readers, i.e., in print. If your publisher stops exercising its right to print and distribute hardbound, paperback or trade copies of your work to sales outlets, you want to be able to offer those same rights to another publisher, including a hybrid or self-publishing service provider. A contract provision that allows you to terminate your current publishing relationship if your work is no longer in print can become an opportunity to generate a second life for your work and additional income for you long before the copyright expires. So what do you have to do when negotiating your publishing contract? First, be sure that your contract defines what it means for your book to be in-or-out-of print. In today’s print-on-demand (POD) world, a publisher might claim that your book is still in print as long as it’s available on a POD basis. Be aware that a book that is available in bookstores is not in bookstores but can be ordered from bookstores. If your goal is to have print books on bookstore shelves, then you want your contract to define in print books as printed hardbound, paperback or trade book copies distributed to sales outlets by the publisher. Having a provision allowing you to terminate if your book is no longer in print is only as effective as is your definition of in-or-out-of-print. Second, don’t rely on the publisher to notify you that it has stopped or intends to stop printing your work. Most of these provisions make it your responsibility to know whether your book is in print. If you can get your publisher to relieve you of that responsibility, do so. Perhaps you can persuade the publisher to add some language to the contract that requires them to let you know in writing that they’ve stopped printing your book within sixty days after the event. Whether or not the publisher accepts that responsibility, I suggest that you still independently monitor your book’s in-print status. Third, it often takes a long time to recover your rights once you discover that your work is out of print. 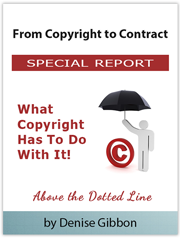 Most contracts require that you give your publisher written notice that your work is out of print (in accord with the in-or-out-of-print definition you agreed to) and that you make a demand for the work to be reprinted. Then you wait—often for twelve months or more–while the publisher decides whether or not to comply with your notice and reprint your work. In the meantime, though, your print book is losing marketing momentum as well as royalties from sales! And because your publisher might agree to reprint your work, it will be difficult to shop your print rights to another publisher. For these reasons, try to shorten the time within which your publisher has to decide whether to reprint your book to about three months. So when it comes to negotiating with any publisher, include the following in your discussions and your contract. Persuade your publisher to take no more than three months to decide whether to reprint your book following receipt of your notice that the book is out of print. Better still, continue writing while your literary attorney negotiates for you! Some Top 20 Authors Contract with Writers for Hire – So Can You!